One of the greatest deceptions taught today is that a Biblical tithe is ten percent of your income. No one in the Bible ever gave ten percent of their income; and if you are wondering about Abraham or Jacob, I will address their tithes in this article. Old Testament law required that God’s people give one-tenth of the increase of only livestock and crops. That’s right, flocks and crops only. Tithing was not for any other asset, income or wages. There was a provision made where you could exchange tithed flocks and crops into money, but only if the journey to deliver the tithe was too far, and then the money had to be converted back into flocks and crops when you arrived. The scriptures are clear on this and consistently and repeatedly limit tithing to flocks and crops. belongs to the LORD; it is holy to the LORD. Note, this scripture says the tenth animal should be given, not the first. You give a tenth of your spices--mint, dill and cumin. But you have neglected the more important matters of the law--justice, mercy and faithfulness. Among other things, Jesus was pointing out the Pharisees legalism because they were correctly tithing on the only tithe that was required of them, their herb garden, which were the only crops they reaped, the small patch of herbs outside their kitchen door! 1. Landowners/farmers (not their workmen) who had reaped a crop. 2. Flock owners (not their shepherds) who had more than 9 livestock born in a year. 3. Levites, who sent their tithe to the temple. Old Testament law actually references three tithes, but the only tithe you’re likely to hear preached from a pulpit is a distortion of the Levitical tithe. 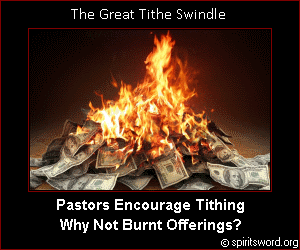 We should ask why those preachers don't encourage practicing the other two tithes? And why don't they teach against tithing every seventh year (Sabbath year)? Not given to the temple. Given to Levites who lived throughout Israel. The Levitical tithe was given once a year, but not on Sabbath years. Levites were not priests; they had normal secular jobs, but would serve in the temple less than 10 days a year. The Levites would tithe on the tithe they received, and that was given to the priests at the temple. Levites were given this tithe because they were not allowed to own land in Israel (outside of cities) under the Jubilee system, and this made flocks and crops (fruit of the land) appropriate compensation. This flock and crop feast was spent on a celebration for your own family. This tithe was given four out of seven years, not on Sabbath years. The poor were invited to share the increase of your flocks and crops. This tithe was given two out of seven years, not on Sabbath years. Why flocks and crops only? 1. The Levites were banned from owning land in Israel (outside of cities). Therefore the flocks and crops were compensation as they had no inheritance in the land under the Biblical Jubilee system; and a practical consideration as they couldn’t easily raise their own flocks and crops. 2. There’s a theme throughout the scriptures which may indicate that the tithe was an acknowledgment of a miracle of God. It was God who gave birth to new life, and God caused crops to grow. God did not want people to bring the fruit of their works as an offering. 3. A third reason may have been that this system generally put the burden of the tithe on the wealthy. Some point out that Abraham’s tithe was before the law, so it’s an example of how we should tithe even though we are no longer under the law. However, Abraham’s tithe was a one-time event with no record of Abraham ever doing this at any other time in his life. It had nothing to do with a law or principle of tithing, at best it was a onetime free-will offering. Abraham gave ten percent of the spoils of a single battle to the priest Melchizidek. Abraham did not give ten percent of his wealth, assets, flocks or income. He only gave ten percent of the profit from a single battle. Incidentally, Abraham gave the other ninety percent of the spoils to a pagan king, the king of Sodom! Jacob promised to give God ten percent of everything God gave him, but only if God watched over and provided for him and returned him to his family. Many theologians say there’s no record of Jacob (the great deceiver) ever keeping his conditional promise. But when Jacob returned to his family he gave a portion of his flocks (of which God miraculously had given the increase) to his brother Esau upon their reunion. It’s likely that this was either Jacob keeping his promise to God, or God orchestrating the kept promise. But again, this was a one-time event triggered by Jacob’s return to his family. Many theologians missed that Jacob kept his promise to tithe, because they are conditioned into thinking of the tithe as something given to the temple or a priest. But actually the Biblical record shows that tithes were shared with brothers, family, the poor among them, and given to distantly related Levites without land. Any attempt to associate tithing with income is completely unbiblical. 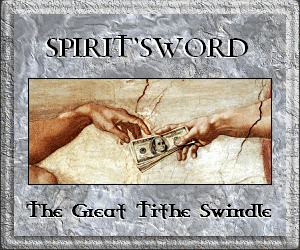 Those who know the truth about tithing but fail to teach it are complicit in this church-wide deception. Instead, let’s look to the New Testament scriptures that encourage generosity and looking after those in need. How can the church be supported without the tithe? This question should be explored, but only after the tithe deception has been acknowledged. Free will offerings, without false teaching designed to manipulate, is one option. We must also remember faith. Many preachers promise God's provision and blessing if you are obedient to tithe. Can't God also provide for and bless His church when that church is obedient to turn away from deception and false teaching? Although giving flocks and crops helped God's people to acknowledge the provision and work of God, instead of bringing their own works, in their hearts people still sometimes brought God their own works. Cain thought he would please God with the fruit of his work, but it was Abel's blood sacrifice that God accepted. Later she gave birth to his brother Abel. Now Abel kept flocks, and Cain worked the soil. In the course of time Cain brought some of the fruits of the soil as an offering to the LORD. And Abel also brought an offering--fat portions from some of the firstborn of his flock. The LORD looked with favor on Abel and his offering, but on Cain and his offering he did not look with favor. So Cain was very angry, and his face was downcast. After Abram returned from defeating Kedorlaomer and the kings allied with him, the king of Sodom came out to meet him in the Valley of Shaveh (that is, the King's Valley). Then Melchizedek king of Salem brought out bread and wine. He was priest of God Most High, and he blessed Abram, saying, "Blessed be Abram by God Most High, Creator of heaven and earth. And praise be to God Most High, who delivered your enemies into your hand." Then Abram gave him a tenth of everything. The king of Sodom said to Abram, "Give me the people and keep the goods for yourself." But Abram said to the king of Sodom, "With raised hand I have sworn an oath to the LORD, God Most High, Creator of heaven and earth, that I will accept nothing belonging to you, not even a thread or the strap of a sandal, so that you will never be able to say, 'I made Abram rich.' I will accept nothing but what my men have eaten and the share that belongs to the men who went with me--to Aner, Eshkol and Mamre. Let them have their share." Save me, I pray, from the hand of my brother Esau, for I am afraid he will come and attack me, and also the mothers with their children. But you have said, 'I will surely make you prosper and will make your descendants like the sand of the sea, which cannot be counted.'" He spent the night there, and from what he had with him he selected a gift for his brother Esau: two hundred female goats and twenty male goats, two hundred ewes and twenty rams, thirty female camels with their young, forty cows and ten bulls, and twenty female donkeys and ten male donkeys.